Dead Sea Mud – is an alluvial deposit containing organic animal and plant remains (algae) together with a mixture of salts and minerals from the Dead Sea. The rich mineral mud has proved highly beneficial for both therapeutical and cosmetic treatments. The remarkably absorbent clay penetrates deep into the pores, thoroughly cleansing and removing grime which impedes the nourishing process. Through reverse osmosis, minerals from the mud nourish the skin and restore its vitality. 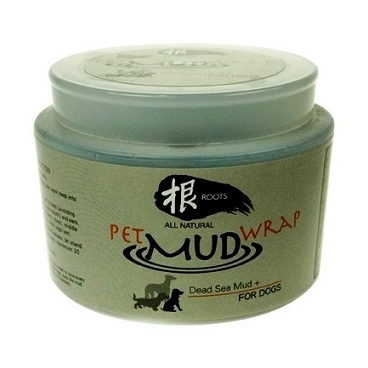 The mud stimulates blood circulation and helping to relieve painful joints, is also excellent for softening dry skin. It stimulates, tightens, and invigorates the skin, leaving it with a healthy glow. When prepared to use as a mud wrap, it provides in-depth cleansing of scalp and hair, leaving the hair shiny and with a healthy bounce. Apply mud liberally and work deep into the coat. Starting from pets’ head ( avoiding the eyes, nostrils, and mouth ) and ears, follows by the neck, chest, middle, and hindquarters, finishing leg last. For maximum effectiveness, allows to stand for 15 to 20 mins. Rinse off completely, leaving your pet with a fresh, clean smell.